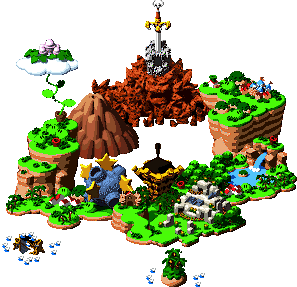 Bandit's Way is a location in Mushroom Kingdom from the game Super Mario RPG: Legend of the Seven Stars. Although geographically a part of the Mushroom Kingdom, Bandit's Way is largely controlled by thieves and other crooks, similar to Rogueport. The bandits are very protective of their hideout and will defend their territory from outsiders. 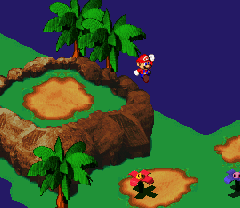 Bandit's Way is the place where Mario and his new ally Mallow chased down the crook Croco during the events of the game. The level also features the first appearance of gravity-defying Boards. Although filled with criminals, many people from all over the world have traveled to Bandit's Way to experience these hovering platforms. The music of Bandit's Way heavily resembles that of The Russian Dance from Tczaikovsky's The Nutcracker. ↑ Super Mario RPG: Legend of the Seven Stars Nintendo Player's Guide, page 22. This page was last edited on May 24, 2018, at 01:15.